“Left, right! Left, right! Say ‘sir, yes sir,’ do you understand?” yelled a drill instructor at the motley formation newly arrived at Marine Corps Recruit Depot San Diego. “Eyeballs up, swing your arms!” he ordered, as beads of sweat trickled down their foreheads under the hot sun. The group struggling to march in unison was not made of fresh U.S. Marines recruits but respected civilian leaders who traveled from across the country to participate in the Joint Civilian Orientation Conference organized by the U.S. Department of Defense. Among them was Florence Clark, associate dean and professor of the USC Division of Occupational Science and Occupational Therapy, who was chosen from hundreds of nominees to attend the event. From July 22-28, Clark joined other leaders from industry, media, entertainment, health care, nonprofit and public sectors, as well as academia, to get a firsthand look at the inner workings of operations across all five branches of the military. Sponsored by the U.S. Secretary of Defense, the conference is a program for public opinion leaders who are interested in expanding their knowledge of the military and national defense issues. The leaders, in return, share the knowledge and experiences with their professional and personal networks. The oldest such outreach program of its kind, the Department of Defense has organized 84 renditions of the event since 1948. During the whirlwind week, Clark had the opportunity to tour military facilities across the country, meet top Pentagon brass and simulate various demands of military life, including the first hours of Marine Corps boot camp — drill instructor and all. The conference began at the Pentagon with a briefing by senior military leadership, including Acting Assistant Secretary of Defense for Public Affairs and Pentagon Press Secretary George Little in Washington, D.C. Participants then traveled aboard a U.S. Air Force Boeing C-17 transport aircraft to Andrews Air Force Base in Maryland and then on to Nellis Air Force Base outside Las Vegas, where they watched more than 20 fighter jets take off for nighttime exercises and interacted with members of the U.S. Air Force Aerial Demonstration Squadron, popularly known as the Thunderbirds. 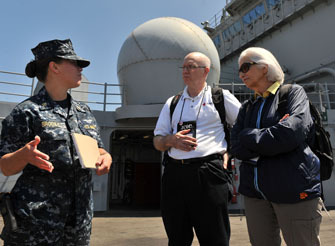 The following day included a tour of new facilities to improve quality of life at Naval Base San Diego and a voyage aboard the USS Makin Island, an amphibious assault ship, out of its home port on Coronado Island, Calif. The next day, the group was off to boot camp and a series of obstacle course simulations at Marine Corps Recruit Depot San Diego. It also examined training technology at Marine Corps Base Camp Pendleton that deploys virtual reality to simulate an Afghani village, complete with avatars of local nationals. The group later flew to Joint Base Lewis-McChord near Tacoma, Wash., where U.S. Army soldiers demonstrated medical evacuation operations, Stryker Armored Vehicle capabilities and bomb detonation procedures. To learn about the Coast Guard, participants toured a patrol boat and took part in cold-water survival training at U.S. Coast Guard Sector Seattle. After flying back to Washington, D.C., the conference participants paid a somber midnight visit to the National 9/11 Pentagon Memorial. The following morning they toured Walter Reed Army Medical Center, including the National Intrepid Center of Excellence, a Department of Defense facility dedicated to the research, diagnosis and treatment of traumatic brain injury and other psychological health conditions among service members, veterans and their families. 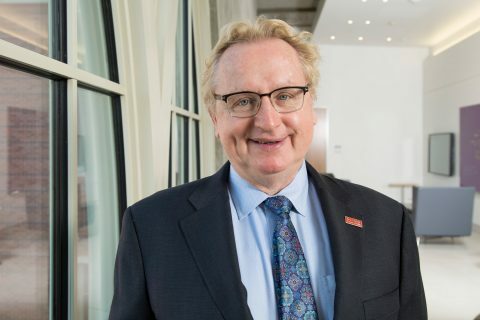 Clark serves as president of the American Occupational Therapy Association, the national professional association of occupational therapy practitioners. Every day, thousands of occupational therapy practitioners across the country work with veterans and active duty service members to achieve physical rehabilitation, mental health and community reintegration goals. Having established new contacts at the Department of Defense, Clark left the conference looking forward to collaboratively working toward strengthening the USC Division of Occupational Science and Occupational Therapy’s services to best meet the health and reintegration needs of service members. She also expressed her appreciation for the unique access that the conference provided to civilians and a sense of gratitude for the selflessness of America’s military personnel.